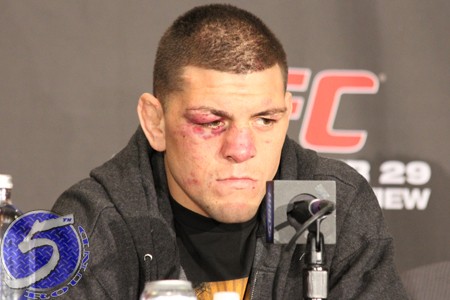 During Nick Diaz’s (pictured) premature and short-lived retirement, the 29-year-old claimed he would return to the sport of mixed martial arts if he was offered a scrap against UFC middleweight king Anderson Silva. UFC president Dana White’s response, ‘Thanks, but no thanks.’ First and foremost, the matchup doesn’t make any sense. Furthermore, there are other superfights White has in mind for “The Spider” before he calls it quits. Speaking of blockbuster bouts, Diaz believes that if he’s not deserving of a shot at Silva, then UFC welterweight champ Georges St-Pierre should be banging down White’s door demanding a tango with the most decorated champion in Octagon history. “I will tell you right now, I want to fight the #1 fighter in the world. I’ve always said that,” Diaz stated. “Georges has never said that. That’s the only thing negative I’ve ever said about Georges, is that if I were in his place I would do more – I’d be asking for the Anderson Silva fight. Diaz had rattled off 11 straight wins prior to losing to Carlos Condit for the vacant UFC interim welterweight title in February 2012. He was issued a 12-month marijuana suspension shortly after the bout, but was still granted an immediate crack at GSP’s throne upon his return. If Diaz is able to upset St-Pierre on March 16 at UFC 158, Mr. 209 can then make a legitimate claim that he’s worthy of a shot at Silva.